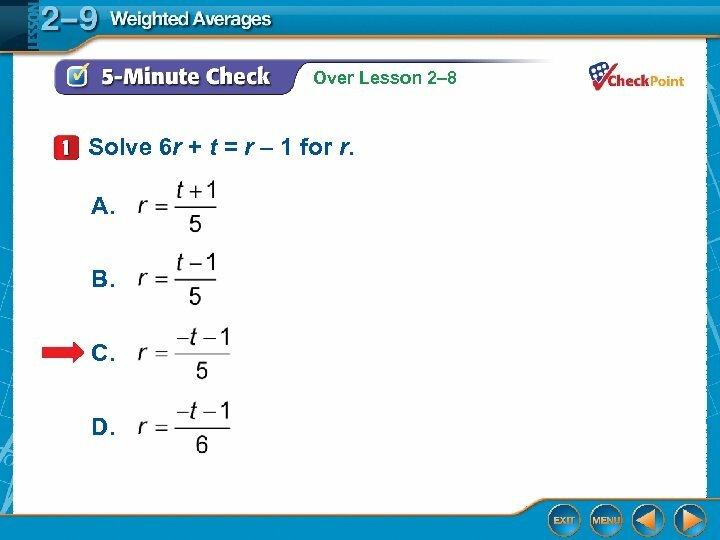 Over Lesson 2– 8 Solve 6 r + t = r – 1 for r. A. 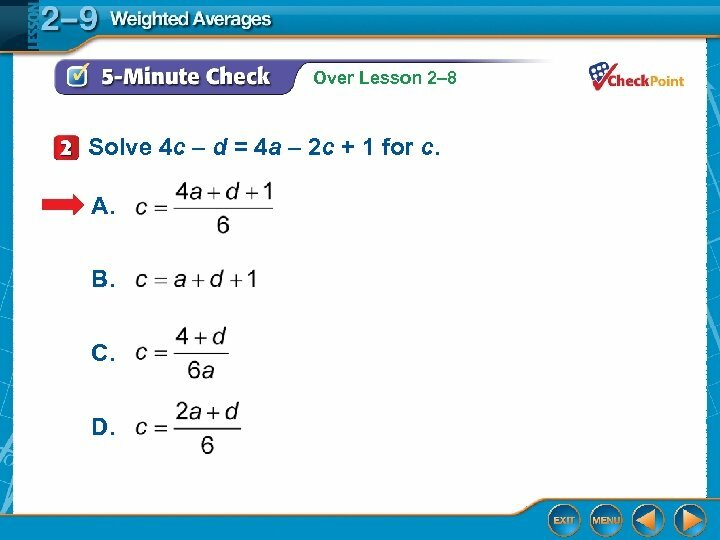 B. C. D.
Over Lesson 2– 8 Solve 4 c – d = 4 a – 2 c + 1 for c. A. 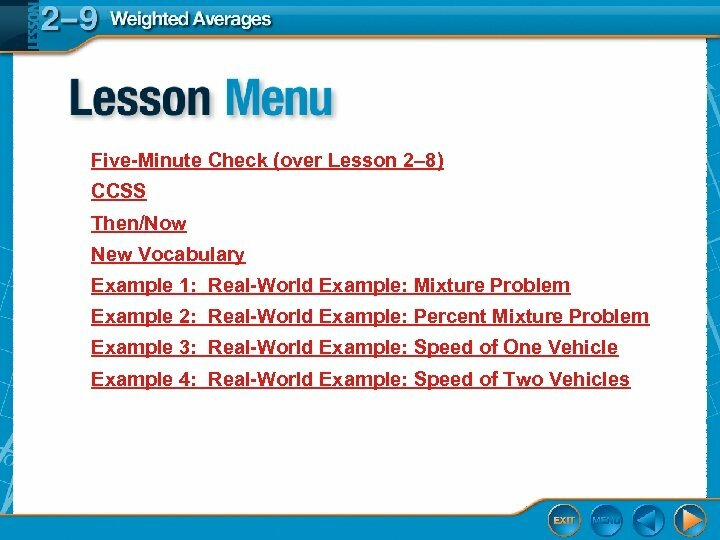 B. C. D.
Over Lesson 2– 8 for h. A. B. C. D.
Content Standards A. REI. 1 Explain each step in solving a simple equation as following from the equality of numbers asserted at the previous step, starting from the assumption that the original equation has a solution. Construct a viable argument to justify a solution method. A. REI. 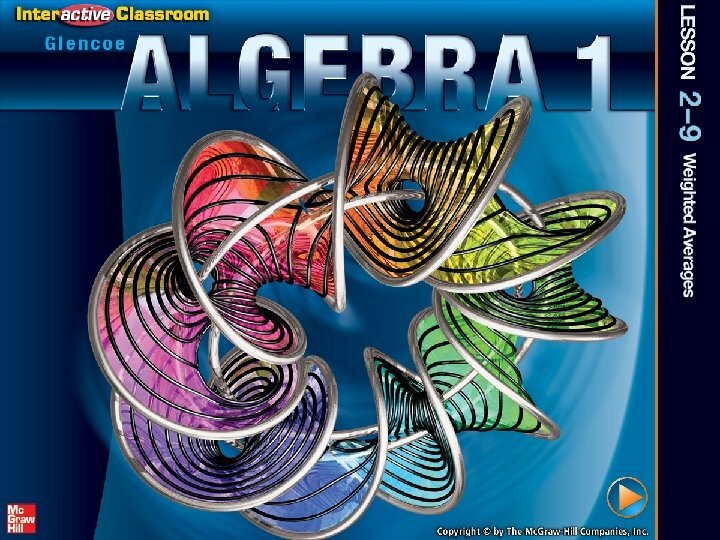 3 Solve linear equations and inequalities in one variable, including equations with coefficients represented by letters. 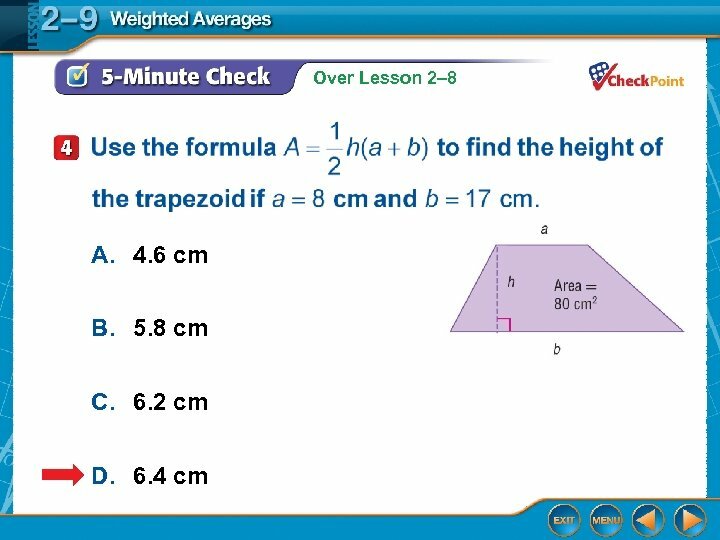 Mathematical Practices 1 Make sense of problems and persevere in solving them. 4 Model with mathematics. 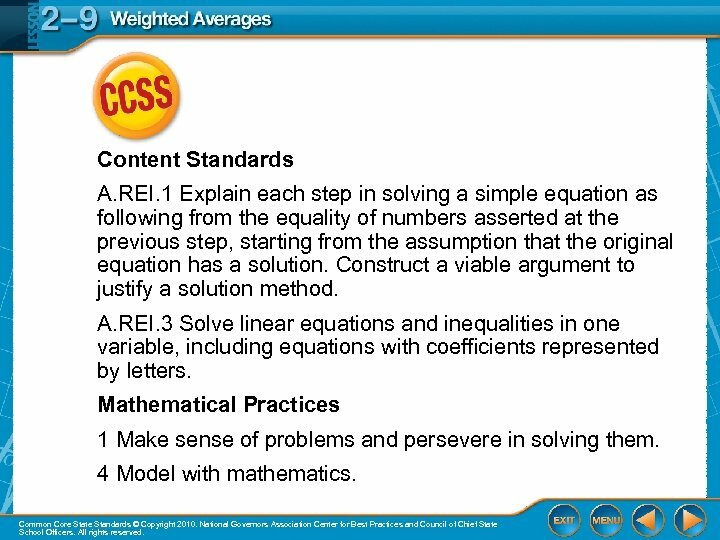 Common Core State Standards © Copyright 2010. National Governors Association Center for Best Practices and Council of Chief State School Officers. All rights reserved. 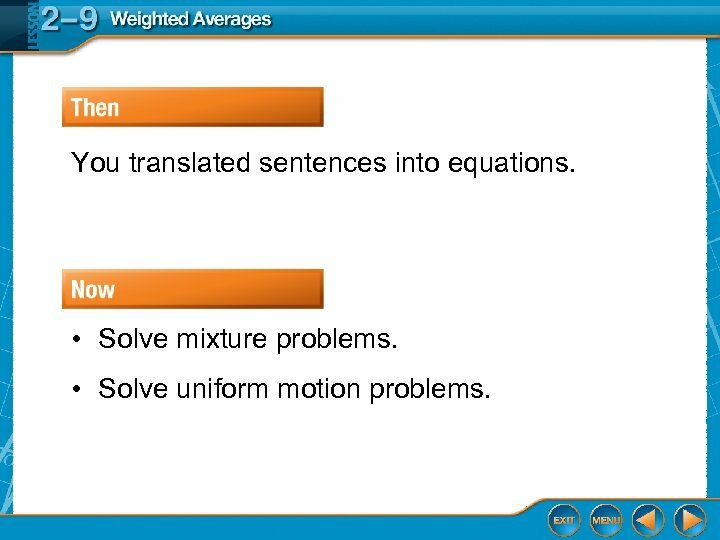 You translated sentences into equations. • Solve mixture problems. 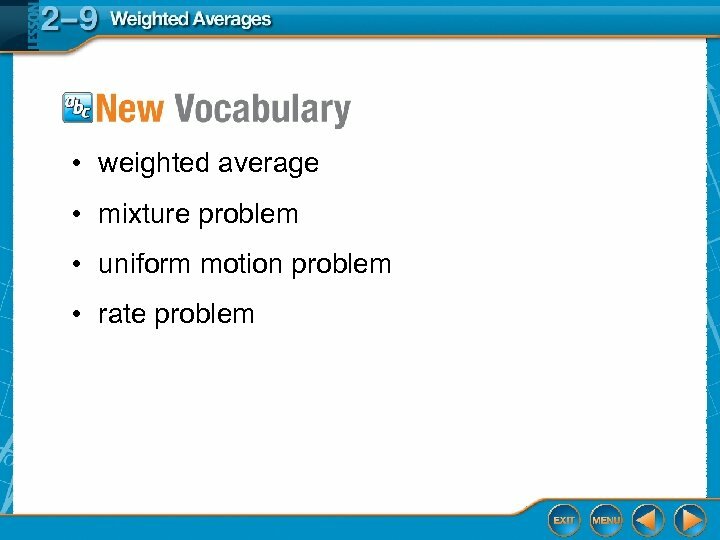 • Solve uniform motion problems. 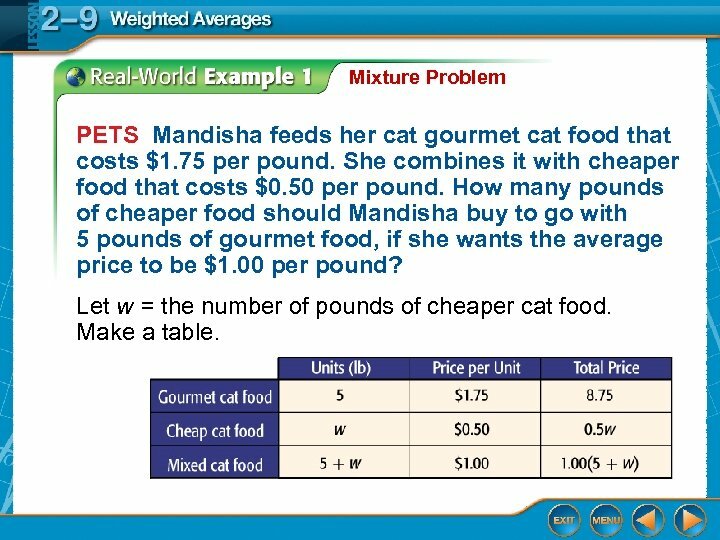 Mixture Problem PETS Mandisha feeds her cat gourmet cat food that costs $1. 75 per pound. She combines it with cheaper food that costs $0. 50 per pound. 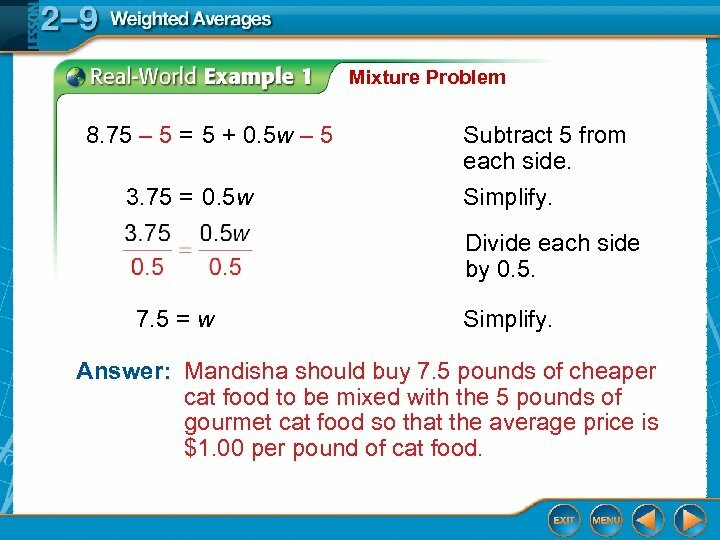 How many pounds of cheaper food should Mandisha buy to go with 5 pounds of gourmet food, if she wants the average price to be $1. 00 per pound? Let w = the number of pounds of cheaper cat food. Make a table. 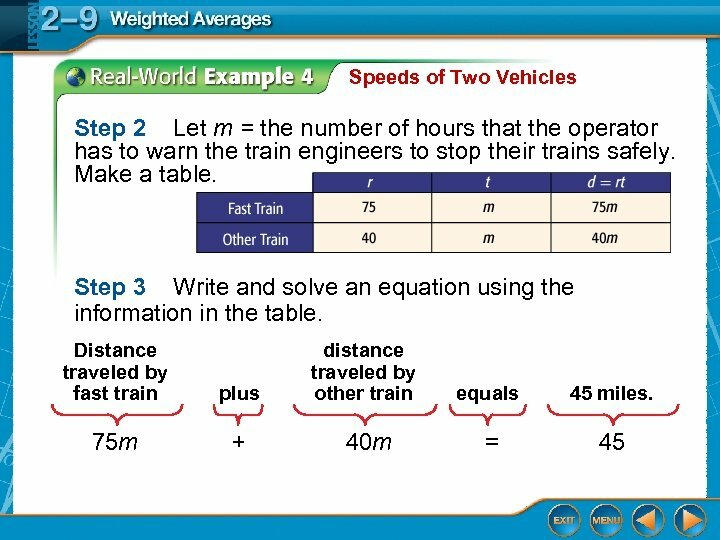 Mixture Problem Write and solve an equation using the information in the table. Price of gourmet cat food 8. 75 plus price of cheaper cat food equals + 0. 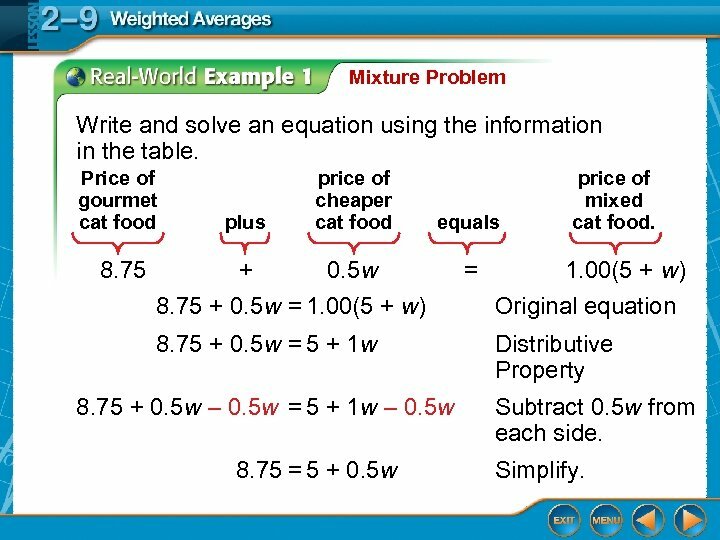 5 w = price of mixed cat food. 1. 00(5 + w) 8. 75 + 0. 5 w = 1. 00(5 + w) Original equation 8. 75 + 0. 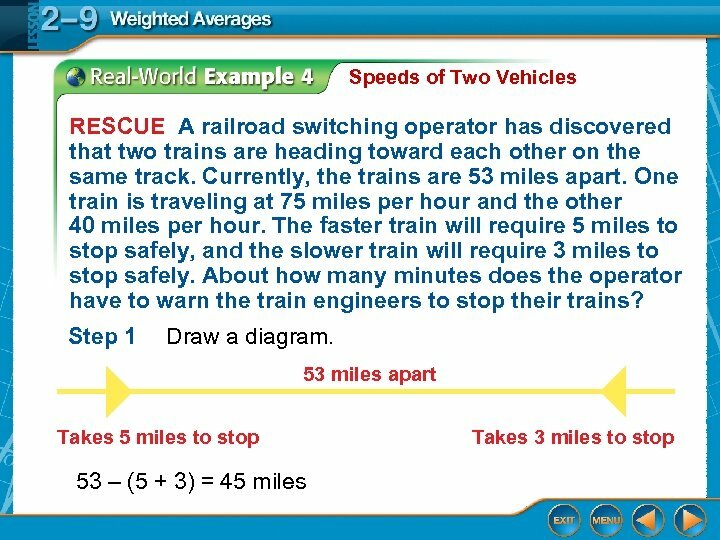 5 w = 5 + 1 w Distributive Property 8. 75 + 0. 5 w – 0. 5 w = 5 + 1 w – 0. 5 w 8. 75 = 5 + 0. 5 w Subtract 0. 5 w from each side. Simplify. 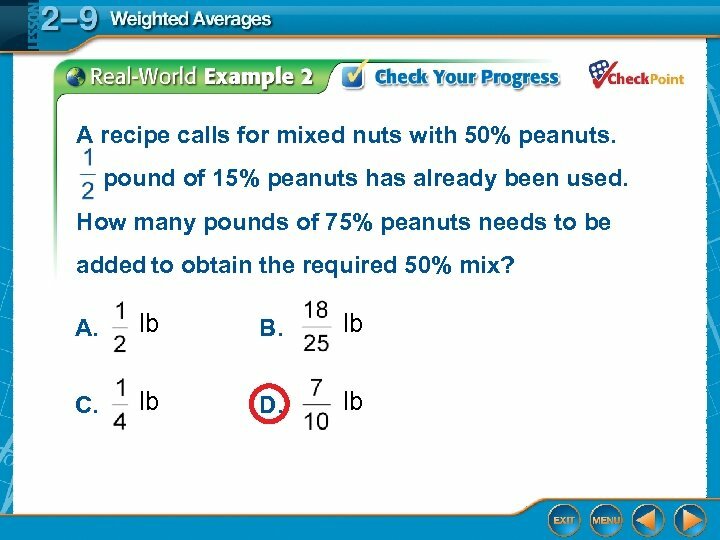 Mixture Problem 8. 75 – 5 = 5 + 0. 5 w – 5 3. 75 = 0. 5 w Subtract 5 from each side. Simplify. Divide each side by 0. 5. 7. 5 = w Simplify. 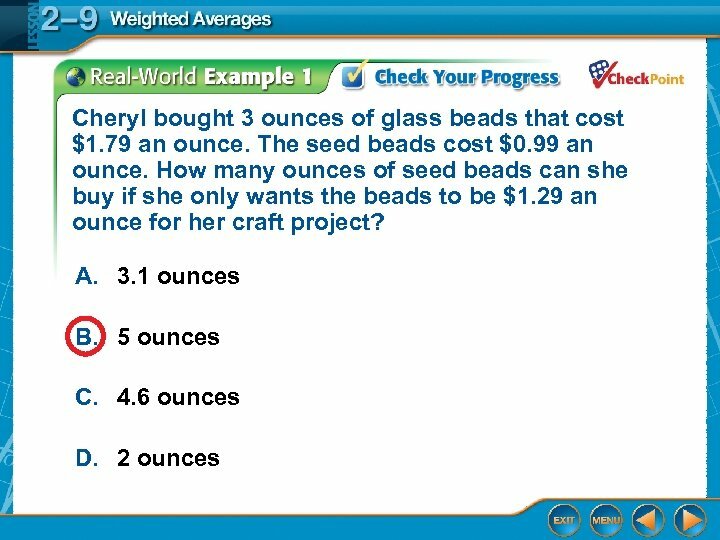 Answer: Mandisha should buy 7. 5 pounds of cheaper cat food to be mixed with the 5 pounds of gourmet cat food so that the average price is $1. 00 per pound of cat food. Percent Mixture Problem AUTO MAINTENANCE A car’s radiator should contain a solution of 50% antifreeze. Bae has 2 gallons of a 35% antifreeze. 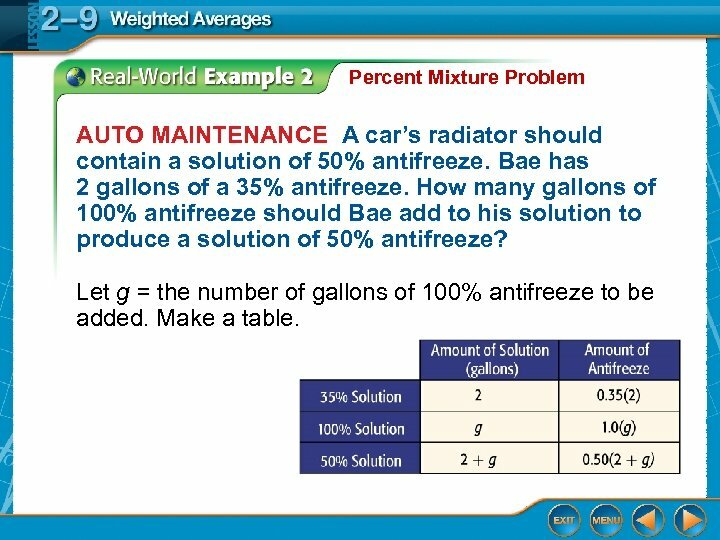 How many gallons of 100% antifreeze should Bae add to his solution to produce a solution of 50% antifreeze? Let g = the number of gallons of 100% antifreeze to be added. Make a table. 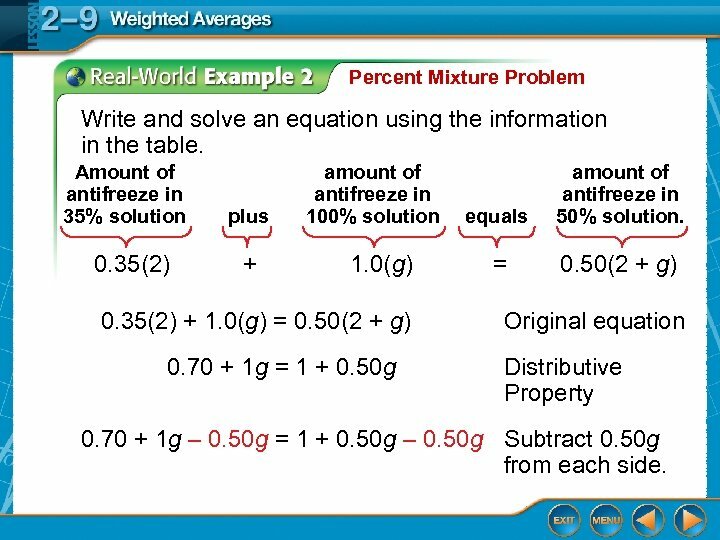 Percent Mixture Problem Write and solve an equation using the information in the table. Amount of antifreeze in 35% solution 0. 35(2) plus + amount of antifreeze in 100% solution 1. 0(g) 0. 35(2) + 1. 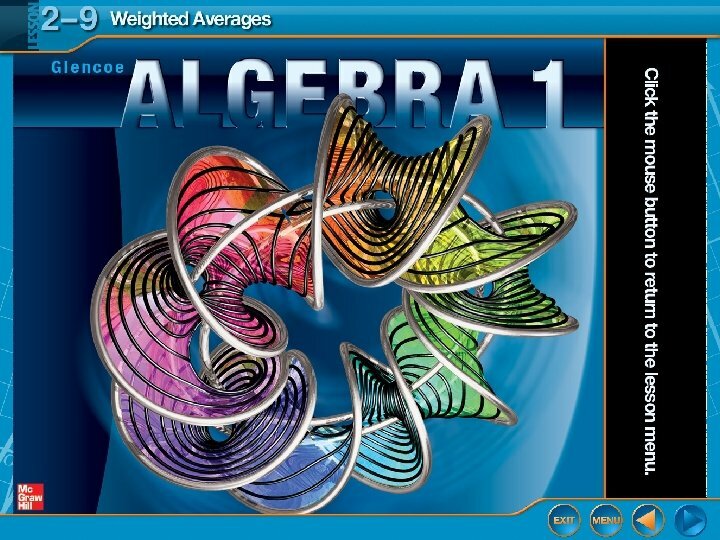 0(g) = 0. 50(2 + g) 0. 70 + 1 g = 1 + 0. 50 g equals amount of antifreeze in 50% solution. = 0. 50(2 + g) Original equation Distributive Property 0. 70 + 1 g – 0. 50 g = 1 + 0. 50 g – 0. 50 g Subtract 0. 50 g from each side. Percent Mixture Problem 0. 70 + 0. 50 g = 1 0. 70 + 0. 50 g – 0. 70 = 1 – 0. 70 0. 50 g = 0. 30 Simplify. Subtract 0. 70 from each side. Simplify. Divide each side by 0. 50. g = 0. 6 Simplify. 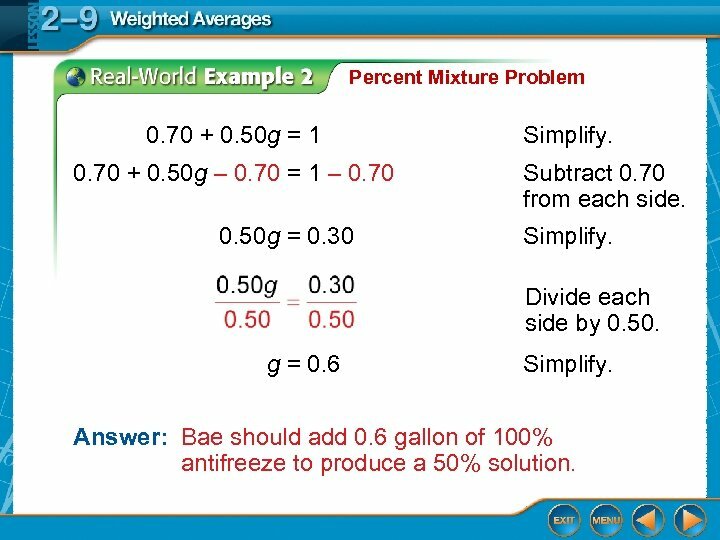 Answer: Bae should add 0. 6 gallon of 100% antifreeze to produce a 50% solution. Speed of One Vehicle AIR TRAVEL Nita took a non-stop flight to visit her grandmother. The 750 -mile trip took three hours and 45 minutes. Because of bad weather, the return trip took four hours and 45 minutes. 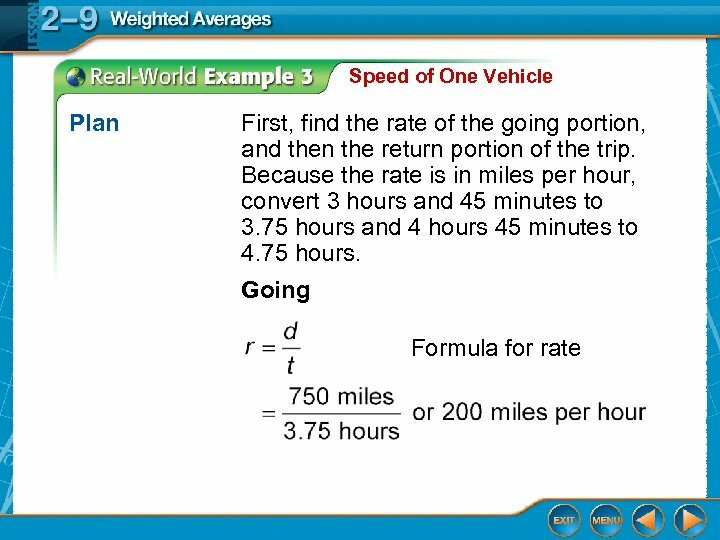 What was her average speed for the round trip? 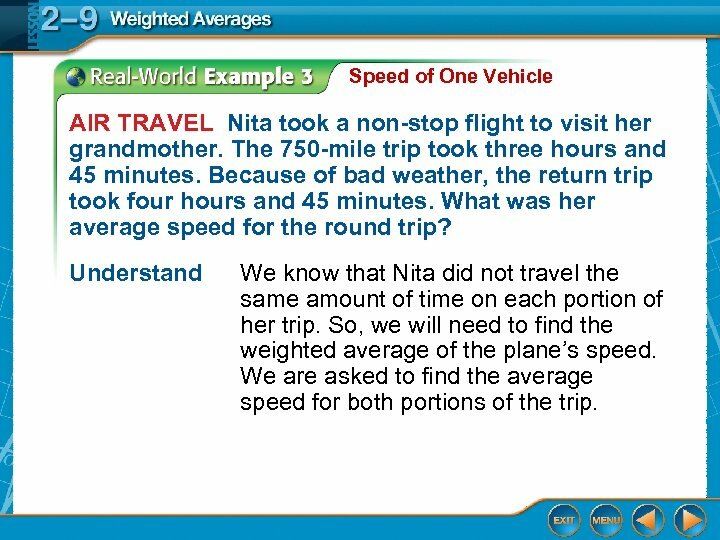 Understand We know that Nita did not travel the same amount of time on each portion of her trip. 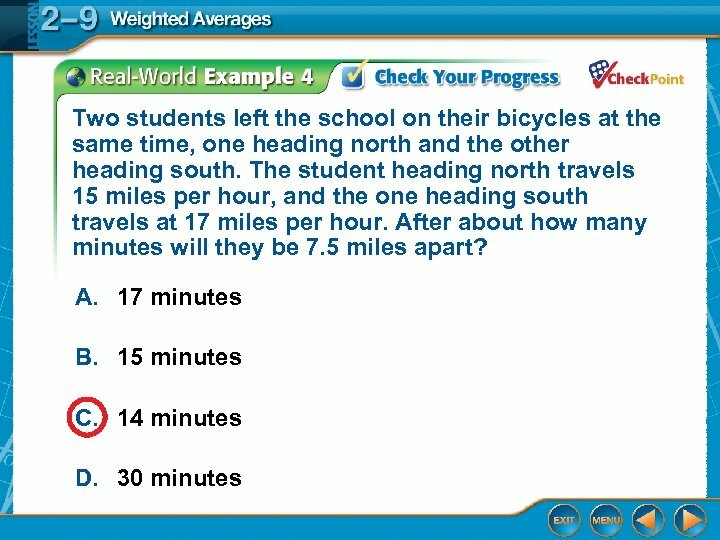 So, we will need to find the weighted average of the plane’s speed. 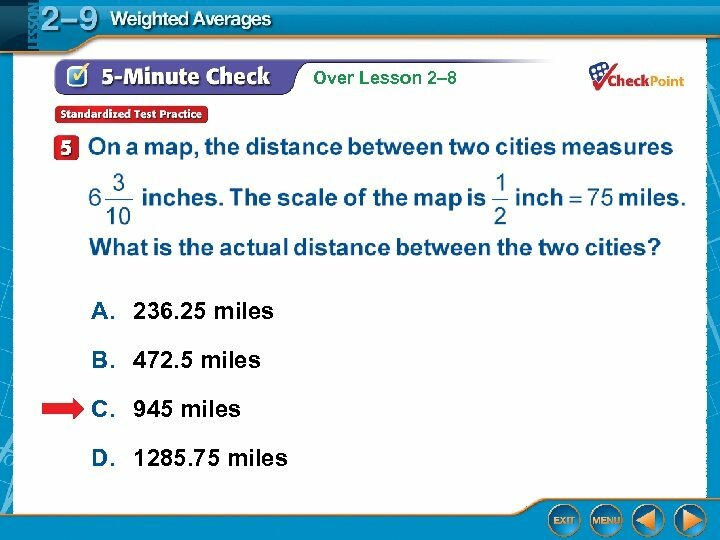 We are asked to find the average speed for both portions of the trip. 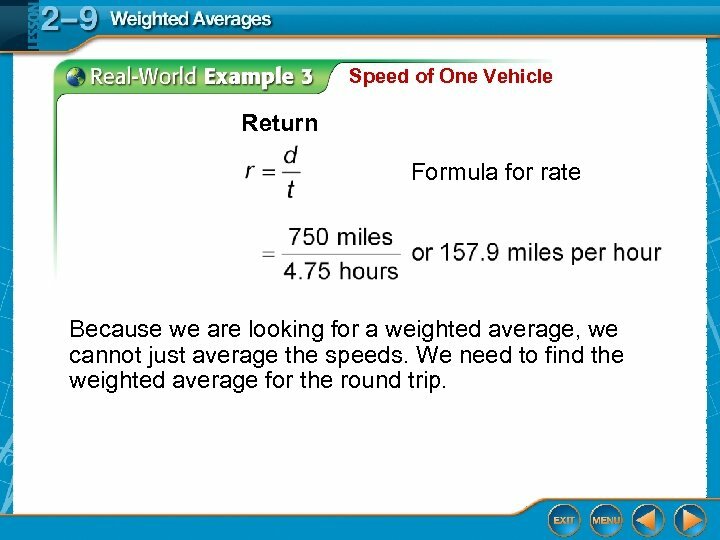 Speed of One Vehicle Return Formula for rate Because we are looking for a weighted average, we cannot just average the speeds. 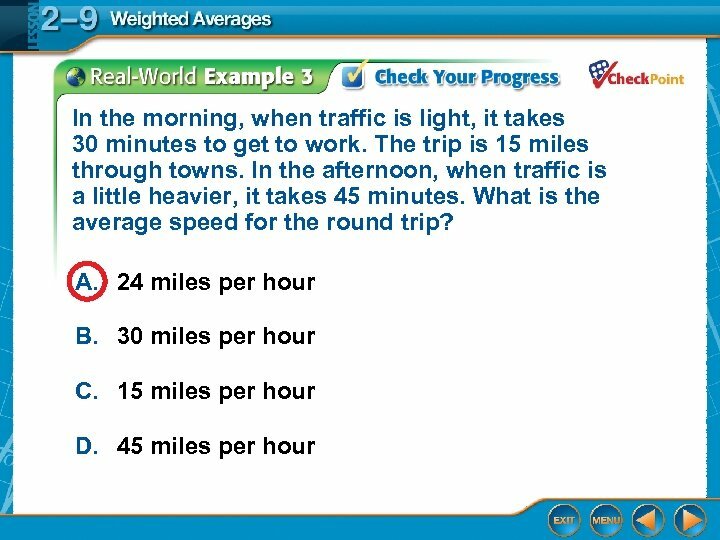 We need to find the weighted average for the round trip. 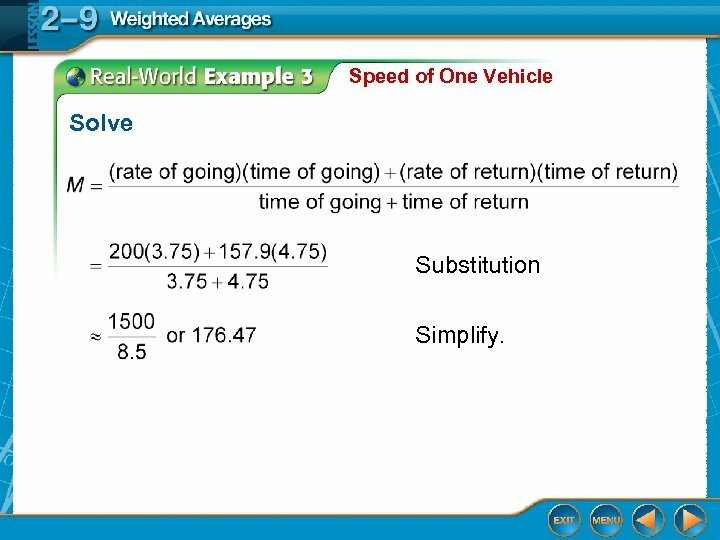 Speed of One Vehicle Solve Substitution Simplify. 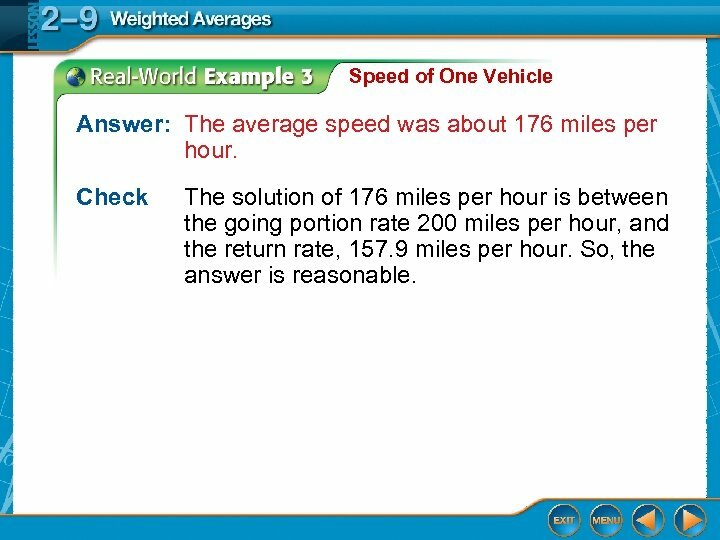 Speed of One Vehicle Answer: The average speed was about 176 miles per hour. Check The solution of 176 miles per hour is between the going portion rate 200 miles per hour, and the return rate, 157. 9 miles per hour. So, the answer is reasonable. 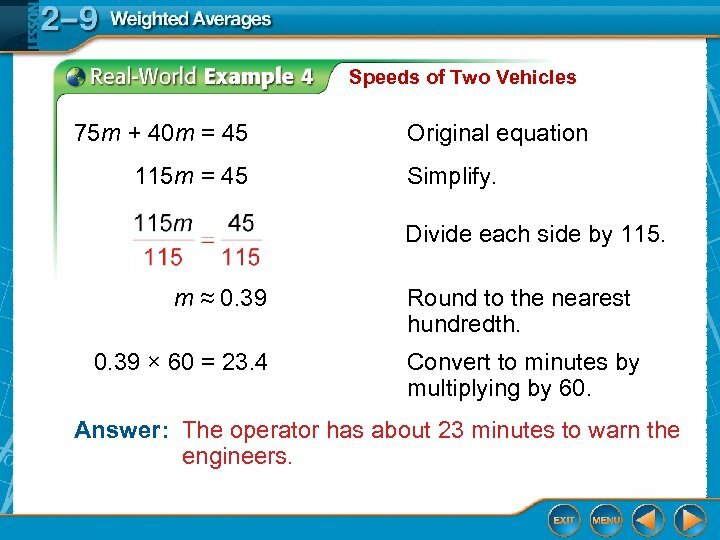 Speeds of Two Vehicles 75 m + 40 m = 45 115 m = 45 Original equation Simplify. Divide each side by 115. m ≈ 0. 39 × 60 = 23. 4 Round to the nearest hundredth. Convert to minutes by multiplying by 60. Answer: The operator has about 23 minutes to warn the engineers.